With the clock ticking down to the holiday season, you may still be scrambling for some last minute gifts. So whether it’s for a teacher, a neighbor, or a co-worker, we have five ideas for some last minute, but still thoughtful, gifts for the procrastinator in all of us. Treat someone in your life to a relaxing massage after the crazy holiday season. This is a great time of year to buy things like this because there are often great specials happening. Whether it’s through a spa, an independent therapist, or even a massage therapy school, you’re bound to find something that fits into your budget. Photo albums have become somewhat of a lost art thanks to technology. Surprise that special someone with memories from the past year or a recent vacation all bound together in a beautiful book. You can even have the album personalized to add that little extra special touch. Chances are, your loved one may have hundreds (or even thousands) of photos on their phone that just sit there. Mobile printers are designed specifically to print photos directly from the person’s smart phone. These don’t take up much room and they’re easy to use. Give the gift of entertainment with an entertainment streaming subscription. This is a super simple gift; all you need to do is purchase a subscription or giftcard, which are available at most major retailers. Gift cards can be used to create a new account or can be applied to an existing account. 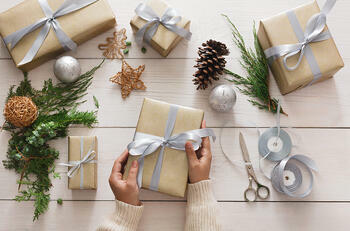 You can even have a few sitting around to reciprocate those last minute, unexpected gifts. Pretty much everyone has a smart phone now, making Bluetooth gifts a great (and super easy) option. Depending on the quality, you can spend anywhere from $19.99 to $400 & upwards for a speaker. Bluetooth headphones are perfect for workout lovers or those just sick of untangling their current headphones. Just a reminder that for every dollar you spend during the month of December, you get double points on all Visa purchases. These points can be redeemed towards travel, gift certificates or cash back rewards.